A 1958 Talon photo depicts a man speaking to an audience in blackface. Following several stories about the history of blackface on college campuses, officials at American University say they have found similarly racist photos in the archives of AU’s student yearbook. In a Monday email memo to the AU community, Provost Daniel Myers and Vice President of Campus Life and Inclusive Excellence Fanta Aw said they directed library staff and faculty to undertake a review of issues of The Talon and its predecessor, AUCOLA, which were published from 1926 to 2009. To view the entire gallery with captions, click here. In those yearbooks, staff identified 15 photos, cartoons and drawings “of concern,” Myers and Aw wrote. Both administrators condemned the "abhorrent" images and the pain they have caused. 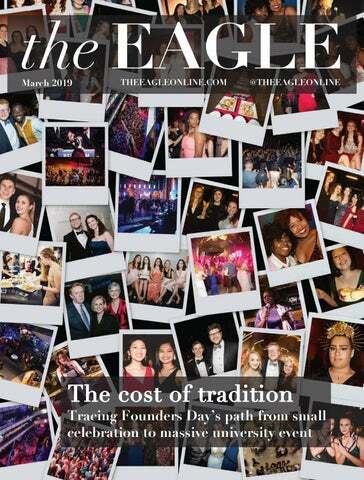 The Eagle reviewed online archives of the yearbooks ranging from 1926 to 1998 (AU does not have copies of yearbooks from 1999 to 2009 on its website). The analysis revealed at least four images depicting students in blackface, including pictures of fraternity members performing in a minstrel show. The photos range in date from the mid-1950s to the early 1960s, with the last blackface photo appearing in 1963. Minstrel shows, which featured white performers in blackface, have historically purported racist stereotypes about black people due to the exaggerated costumes and makeup that distort the features and culture of African-Americans, according to the National Museum of African American History and Culture. The history of blackface has been in the spotlight due to the discovery of a racist photo on Virginia Governor Ralph Northam’s medical school yearbook page that depicts a person in blackface and another person in a Ku Klux Klan hood. Other images showed people wearing Native American, Egyptian and Middle Eastern costumes. Those photos range in date from 1965 through 1991, when several students are pictured wearing Native American headdresses and makeup during a school event. In other photographs from the yearbooks, figures are shown hanging in effigy from campus buildings. It’s unclear from the images what the effigies are depicting. Clarification: Two photos have been removed from the slideshow because The Eagle could not confirm their exact context and ties to racist imagery.